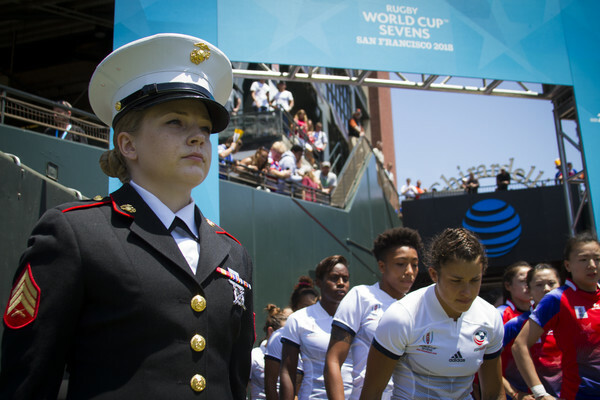 The U.S. Marine Corps partnered with USA Rugby for the 2018 Rugby World Cup Sevens at AT&T Park in San Francisco, California, July 20 – 22. The Rugby World Cup Sevens is the premier stand-alone international rugby competition outside of the Olympic Games. Originating in 1993, the event evolved into what it is today, where 40 teams compete to win. During the three-day event, Marines engaged the community through physical fitness challenges, meeting with USA Rugby affiliates and performing as part of the honor guard to welcome players onto the pitch. As Marines attended the world cup reception July 19, notable rugby players and influencers, like Young, spoke about the characteristics Marines and rugby players have in common. Young agreed and added that the Marine Corps’ core values are what rugby teams embody. The matches were knock-out style, so rugby players were on the pitch for 14 minutes of sudden-death play. Sgt. Nichole Stoehrer, a marketing and communication Marine, and Sgt. Denis Ombasa, a recruiter, both from Recruiting Station San Francisco, were ambassadors of the values shared between the organizations. They stood at attention before the field entrance to honor the world-class athletes stepping onto the pitch. As the event moved forward, Marines met with USA Rugby players, coaches and staff to strengthen connections with America’s youth and their influencers during the tournament. Marine recruiters also participated in USA Rugby’s Impact Beyond program, where they led the rugby community in workout sessions. Marine Corps Recruiting Command first announced the partnership earlier this year in January during the USA Rugby 2018 National Development Summit in Denver.